Our web applications are custom-built to your specifications, easy to navigate, interactive and intuitive. They provide a one-stop essential skills experience with integrated tools that work together. Users can research occupations, assess their skills online and compare their scores with a specific occupational and educational goal. There’s no waiting for results – they get a customized results report and a separate learning plan instantly. You have full control over how your website looks and works. You can even add extra learning features like mouse-overs with text, images and voice to help users become familiar with new terms like trigonometry or bill of lading. How do your clients want to build their essential skills? We can make it happen. 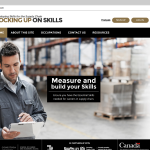 Need an essential skills assessment tool that is customized for your needs? We create assessments that accurately measure a variety of essential skills including reading, document use, numeracy, writing, thinking skills, computer skills, working with others and oral communication. Our assessments are made-to-measure using the same workplace documents that workers use. Whether you need assessments for meat cutters, mechanics or any other occupation, we have you covered. Our assessments are also flexible… test one, two or more essential skills. The choice is yours. Test questions are accurate and proven sound. They can be validated by psychometricians to ensure their accuracy and validity, which is a service we provide. Our online assessments feature adaptive scoring systems that use the results from previously completed questions to determine how difficult the next questions should be. For example, test takers who are struggling will automatically be presented with easier questions. Call us if you are interested in learning more. Organizations create safer, more productive workplaces when they know the tasks that individual workers can and cannot perform independently. Every time someone takes an assessment, they receive a results report that lists their skill level and the tasks they likely can and cannot perform without supervision. This powerful information tells employers and educators where they need to invest additional supervision and/or training for maximum results. It also tells test takers what their strengths are and where they may have skill gaps. Learning plans identify the resources that can be used to address identified skill gaps and help people develop stronger essential skills. They are customized based on the individual’s assessment scores. Our learning management system accesses over 600 learning activities, all available online and free-of-charge. They include instructional videos, practice exercises and self-help guides.